Glycerol is an unusual sugar alcohol (polyol). It is also called Glycerin or Glycerine. It occurs in nature and in the body. It has a mildly sweet taste. It has 4 calories per gram, the highest of any sugar alcohol. It has only 40% of the sweetness of sugar, so it has no special application as part of a calorie controlled diet. It does, however, have a very low glycemic index and is safe to use for diabetics. It is not usually used for it's properties as a sweetener, but as a humecant, it keeps food moist and is one of the best available. Not really used as a sweetener on it's own. However it is used as a food ingredient for it's unique properties. It has a multitude of medicinal applications and is sometimes used during surgery. Can be used as a laxative. It is an ingredient in lotions and hand creams. It has no particular advantage as a sweetener. However it is a common food additive for its ability to add texture and bulk. It can assist in creating a chewy feel and in the retention of moisture. It is harmless to teeth and suitable for diabetics. It has a very low glycemic index (Only 3 - sugar is 65) and this makes it suitable as part of a diabetic diet. Like all sugar alcohols it is not metabolized by bacteria in the mouth and so it does not contribute to tooth decay. It has been found to help reduce fluid loss during extreme exercise, and may be of benefit to athletes and cyclists in this regard, particularly if taken with water just before the workout. See here. It has a mildly laxative effect and in some individuals can cause cramps, flatulence and even diarrhea. Probably best not to consume more than 50 gm per day. Unless it is clearly stated on the list of ingredients, it cannot be assumed to be suitable for vegetarians as it may be derived from animal fat. The FDA does not issue a recommended daily limit on consumption. It is not used in a large number of food products, and when it is, it is usually a minor ingredient. So it is very unlikely that excessive intake will occur. There are many methods of producing it. It can be made from animal or vegetable fat. (These contain approx 10% Glycerol) It is a by product of soap manufacture. It can also be made from petroleum products. Glycerol, Glycerin or Glycerine. Specialist Chemists may stock it. 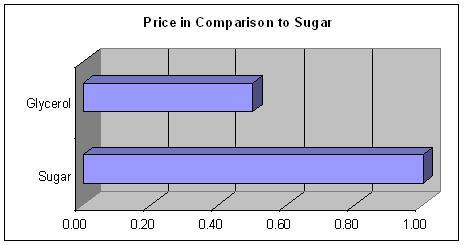 It is about half the price of sugar, by weight, on the bulk market. Smaller quantities are available on line for about $8 per litre. In 2012 it sold approx 2.1 million tonnes equivalent out of a total world sweetener market of approx 188 million tonnes. (Sugar was about 155 million tonnes) This would give it about 1.6% of the total market. However, it has many uses, most of this quantity would not have been used as a sweetener. One spoon of sugar contains 16 calories. To achieve the same sweetness it would be necessary to consume 40 calories of Glycerin, so there is no saving at all. It is an excellent humecant and is often used in museli bars to keep them moist and chewy. It is also used in breakfast cereals and frozen pastries. It used to be used as an antifreeze, in recent times products with lower freezing points are used. It also has antiseptic qualities, and can be used to treat burns and minor skin injuries. It is used as an ingredient in toothpaste, mouthwashes, cough mixtures etc. It is useful in the prevention of bad breath. It is also reputed to assist in keeping the body hydrated during exercise, bodybuilders and runners use it for this purpose. Recognized as a sugar alcohol by the FDA and classified as GRAS (Generally approved as safe). Approved in the EU as E422. No saving over sugar in terms of calories. Is useful for diabetics and it is harmless to teeth. But it can cause discomfort for some people if taken in excessive quantities. More use to the food industry than to the consumer. Has other valuable properties and uses.